Every Person is Metabolically Unique. Shouldn’t Your Treatment be as Well? Functional Medicine is patient-centered care that focuses on the underlying cause of chronic illness and improving prevention, instead of the acute-care medical model that has been applied to non-acute chronic conditions. Today people are dying prematurely and are not achieving optimal health due to the misinformation provided to them regarding the real cause of disease. People today are not aging prematurely because of germs, their genes, or their luck. 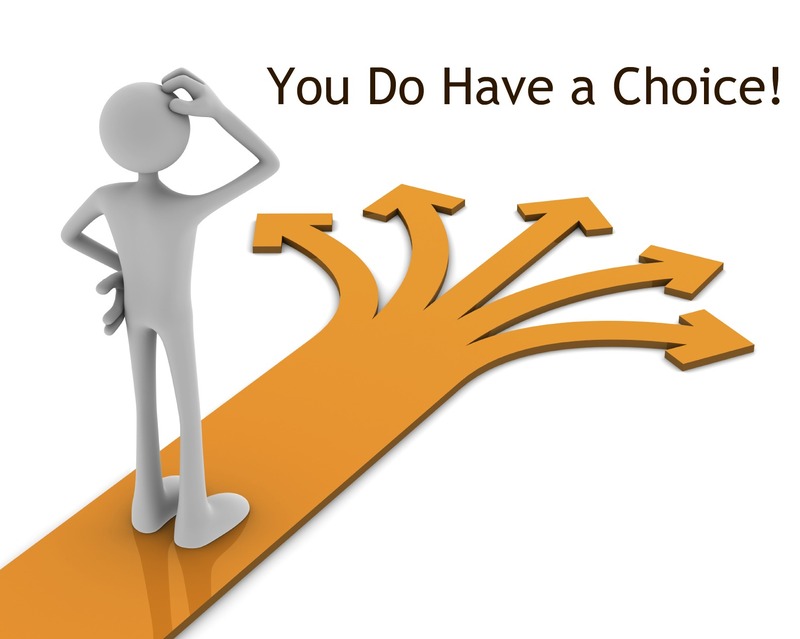 It’s simply not eating the right foods, moving enough, and their thinking. Taking medications puts out the fires but if you keep putting out fires eventually the structure collapses. We don’t need more drugs and less body parts, we need to restore nutrient deficiencies and purify any toxicities. Wellness is about restoring cellular function not just making people feel better or forcing a biochemical reaction with a drug. 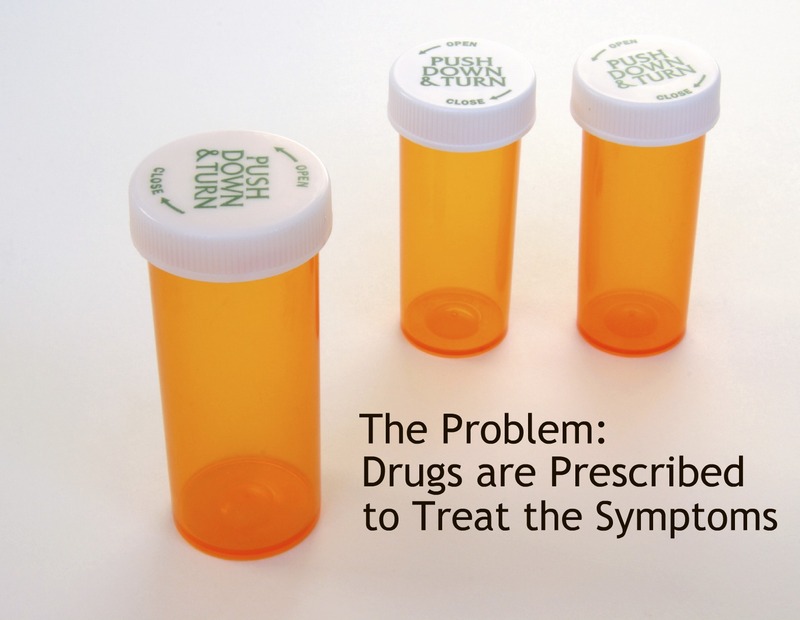 Our current health care system relies on the 20th century, acute care model, which is aimed at prescribing a drug or procedure for symptom management and disease maintenance. It is not a model that reimburses the practitioner for looking into the cause of the patients illness or disease. Unfortunately, when this model is applied to non-acute chronic conditions problems occur. Each person’s biochemical individuality exerts a major influence on his or her health. The level of nutrient intake that maintains the best possible health is highly variable from person to person. Lifestyle choices and environmental exposures filtered through genetic predisposition are fundamental factors in the expression of disease, and a successful treatment approach must include investigation into these factors. Don’t let anyone tell you that you must accept having a disease and have to learn to live with it. Instead, join the thousands of health care consumers who want to get answers to the true cause of diseases. Functional medicine is the future of conventional medicine–available now. It identifies and addresses the root causes of disease, and views the body as one integrated system, not a collection of independent organs divided up by medical specialties. Functional Medicine is patient-centered care that focuses on the cause of your symptoms, instead of the symptom management and disease maintenance approach. 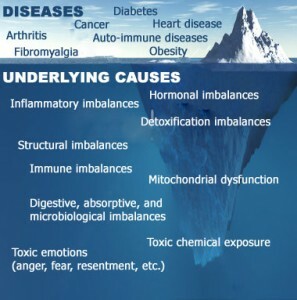 As the following picture of an iceberg shows, a disease or condition such as diabetes, cancer, or fibromyalgia might be visible above the surface, but according to Functional Medicine, the cause lies in the dysfunctional physiology below the surface. 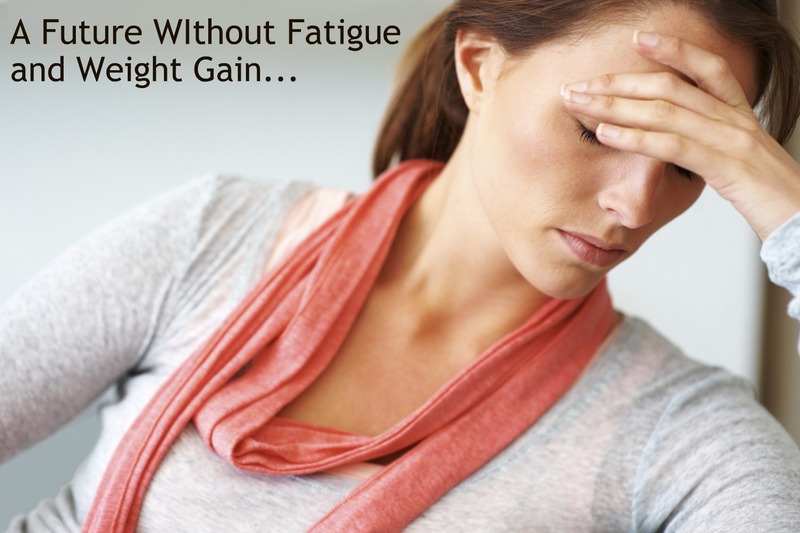 Almost always, the cause of the dis-ease and its symptoms is an underlying dysfunction and/or an imbalance of bodily systems. If traditional medicine just treats tip of the iceberg, it rarely leads to long-term relief and health. Identifying and treating the underlying cause or causes, as Functional Medicine does, has a much better success rate of restoring health. 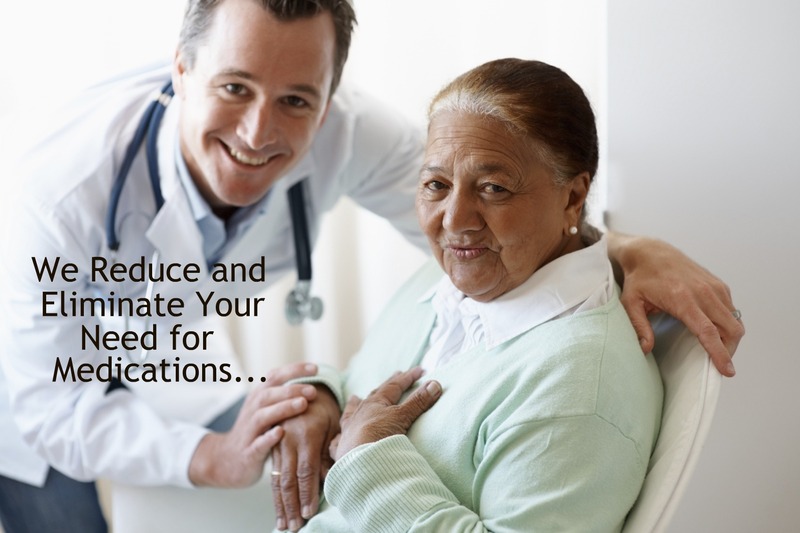 Unlike conventional medicine, treatments are very personalized based on the patient’s unique needs. We are all metabolically different, and our bodies react to conditions in different ways. 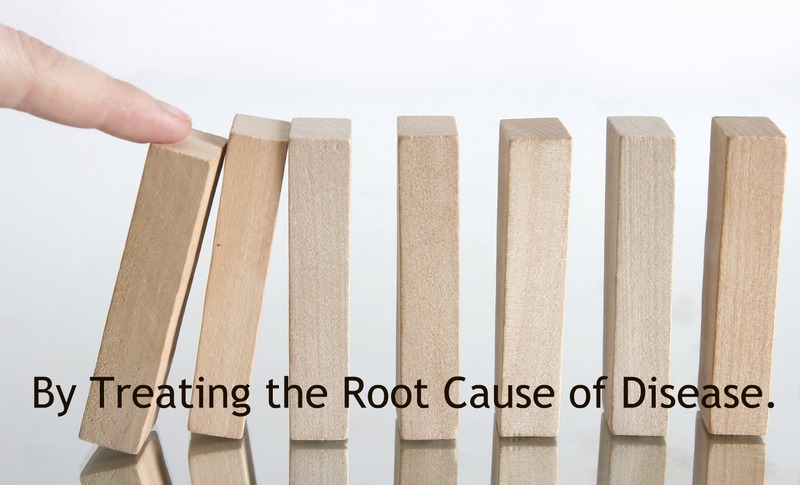 The name of a disease matters less as we understand the cause of the dysfunction. For example, heart attacks may be caused by too much insulin (metabolic syndrome), mercury toxicity, a deficiency of folic acid, a genetic cholesterol disorder, or even bad teeth. Treatment must be matched to the cause, not the disease. Conventional medicine creates specialties such as the cardiologist, rheumatologist, neurologist, endocrinologist, and more, who independently treat each of the body’s systems. Functional medicine recognizes that our bodies are made up of a complex interconnected web of biological systems and processes that need to be treated simultaneously as a whole. It’s not bad luck that one person has multiple “diseases” like heart disease, diabetes, high blood pressure or asthma, ADHD, irritable bowel syndrome and migraines. They are all related. In conventional medicine, when we treat the part and not the whole system, we can’t effectively prevent, treat or reverse chronic illness. Using scientific principles, advanced diagnostic testing (organic acid testing, food sensitivity testing, stool testing, nutrient testing, hormone testing, heavy metal testing) and treatments other than drugs or surgery, Functional Medicine restores balance to the patient’s physiology. 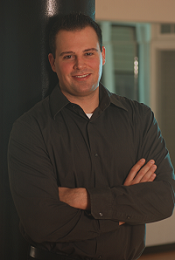 As a result, the patient achieves optimal health. Functional Medicine serving Yardley, Newtown, Langhorne, Holland, Richboro, Levittown, Oxford Valley, Washington Crossing, Pennington, Ewing, Lawrenceville, Trenton, Lower Makefield, Morrisville, Fairless Hills, Southampton, New Hope, Doylestown, Warminster, Warrington, and Bucks County; Nationwide Functional Medicine consultations via phone and email.